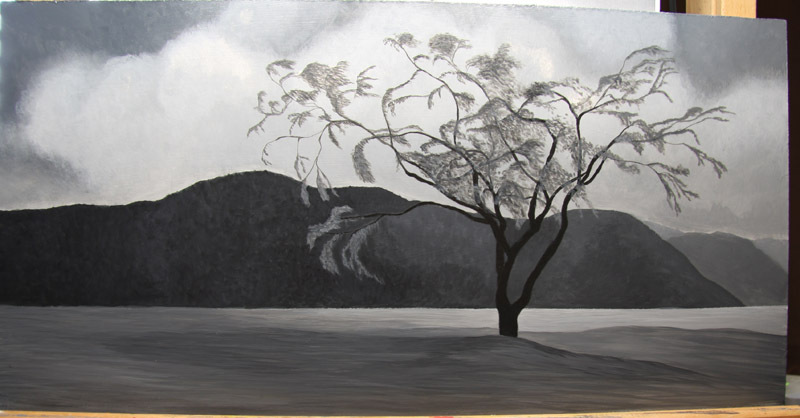 Recycling Your Oil Paints - It Doesn't Get Much Greener! 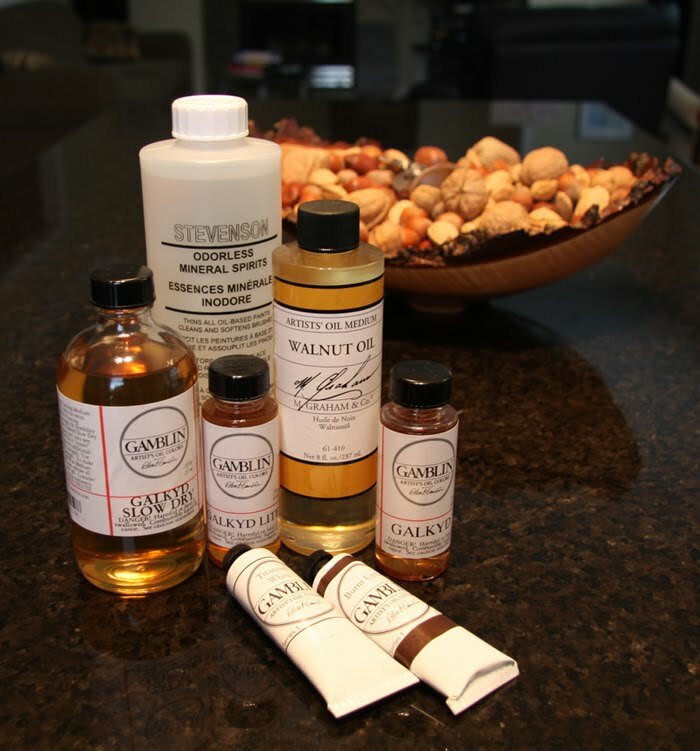 How cool is this video on how to recycle your oil paints from Gamblin Oil paints? It shows you how to recycle the sludge at the bottom of your brush cleaning jar into "new" paint. It also enables you to reuse your cleaning liquid, in this case Gamsol (Gamblin's Odourless Mineral Spirits) so that you never have to dispose of these chemicals but just keep reusing them. I am going to have to give this a try once I get enough slud, just starting out so it could take awhile but I will post and update when I get there :) I am using baby oil to clean my brushes right now for when I paint the next day but I think I will keep a separate jar with the Gamsol for when I won't be painting the next day. The fact that you can keep reusing the solvent is great as I hate to add anymore crap to the landfills. Plus, talk about getting the most bang for your buck! 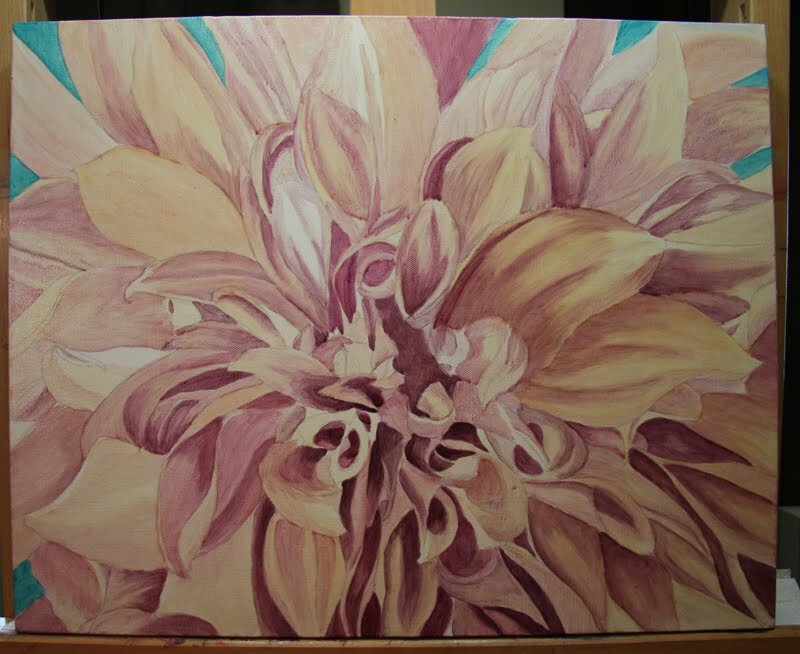 Many more layers of color have been added to this flower but still a fair bit more to go :) The background blues have been laid in and will be glazed so that they are much less bright in the final painting. 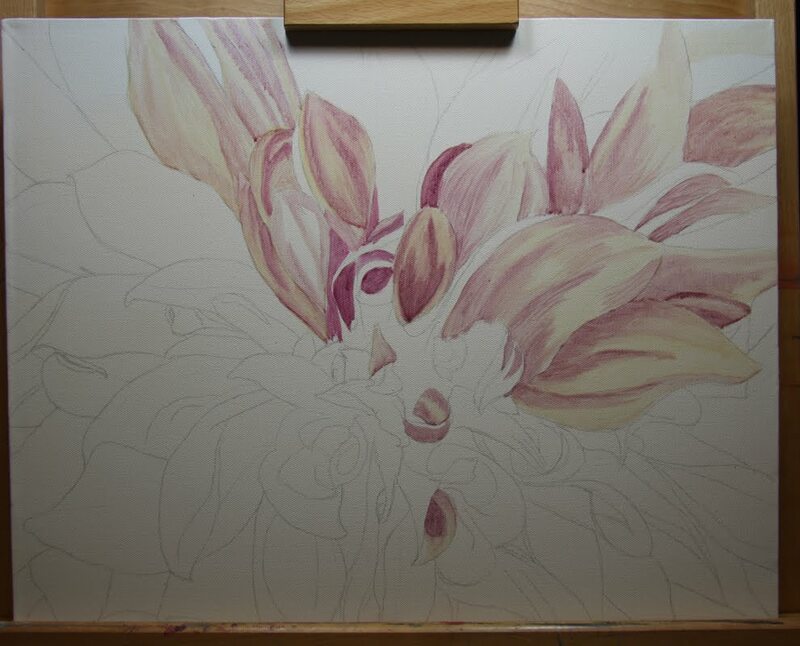 The dark values on the petals need to be deepened to create more depth and then I will add the highlights to the petals as each petal gets nearer completion. I am also thinking I will need to knock back some of the background petals to create more depth as well but I will wait until I get more of the colors laid down. 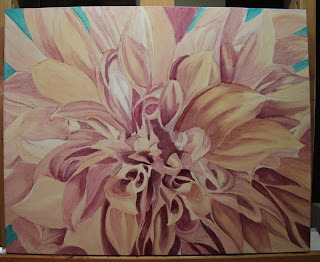 It is not completed but I thought I would post it to show I really have been painting as I have not been posting much lately. 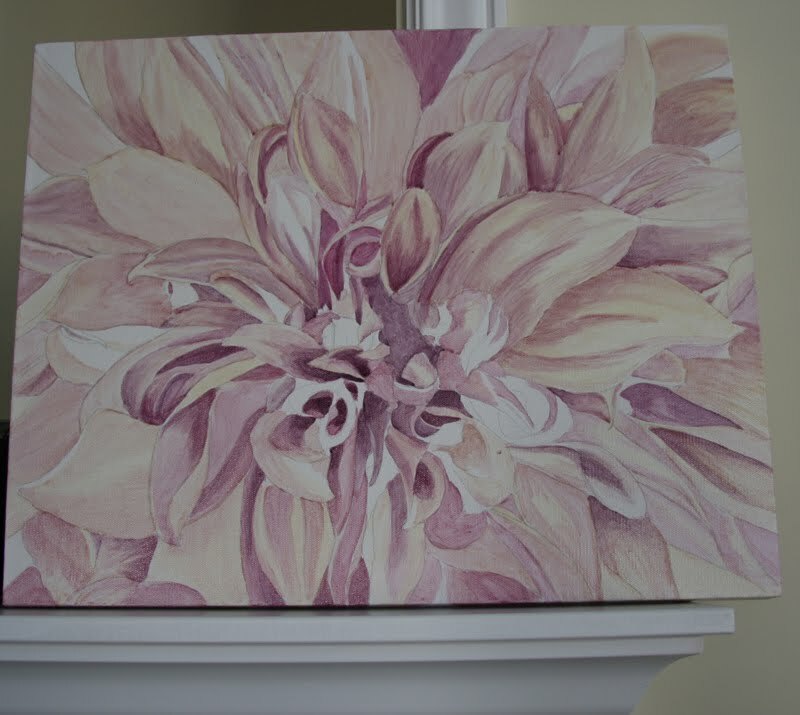 This is a 14x18" oil painting on canvas using a very limited palette, blue, brown & white only. Although it looks very gray online, there actually are hints of blue in the sky and water. I may add a bit of red and yellow here and there in the sky and a bit more blue in the water but will wait a bit to decide. I need to wait for the boat to dry a bit before I add the more details to it as trying to do so wet in wet just was not working too well. I will also soften the clouds more and add more depth to them and possibly add a slight horizon line just to anchor things a bit. 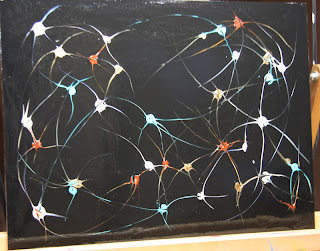 I have recently taken up oil painting and am trying to limit the amount of solvents I use as much as possible. Solvents are very hard on brushes not to mention your health. I came across a great way to clean brushes that is quick, easy & good for brushes as it conditions them in the process. Mason Jar – I use the pint sized jar but any jar or can will do. At the end of your painting session, squeeze the ferrule of the brush into a paper towel or rag to remove as much paint as possible & wipe brushes on paper towel or rag to remove as much paint as possible. Dip into jar and scrub against the screen to loosen the paint further. Keep wiping on rag or towel until no more paint can be removed. 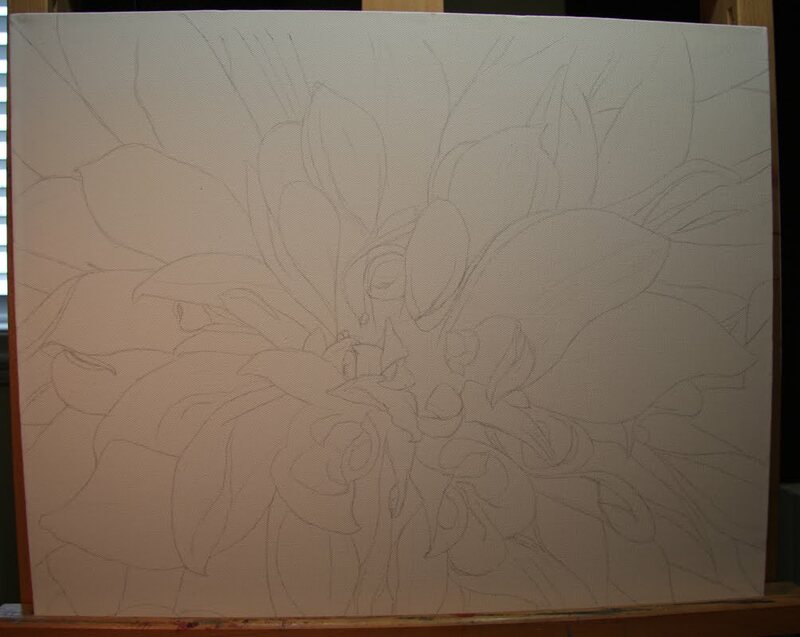 Wew, most of the canvas is now painted for the first layer. Painting around the side always seems to take me longer. 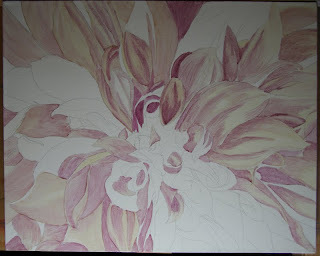 Next I will start putting in the darkest darks and bulding up the layers to create more depth and separation of the petals. Aren't they beautiful!?!? I put my back out (or pinched a nerve or something) last weekend so I was stuck with a heating pad on my back for 3 days, during which I surfed about art stuff, of course :) I was not planning on taking up another medium at this time as I have so much that I want to try with my current mediums that I all ready need an extra 10 hours in my day... but I keep seeing so many amazing artist's work lately using oils that I just could not resist any longer. So I compared all the options (genesis heat set oils, water miscible oils, regular oils) and decided to go with Gamblin oil paints as they seem very high quality & the company seems very into creating great products with the least amount of toxicity. This is my progress so far. I am just blocking in the shapes, lights and darks, to cover the canvas and get a bit more of a roadmap going. I have been playing with my acrylics ALOT lately but nothing worth showing, just having alot of fun play. I wanted to do some more large florals since my last watercolor floral painting, Not Quite White, as they are just so much fun to do. 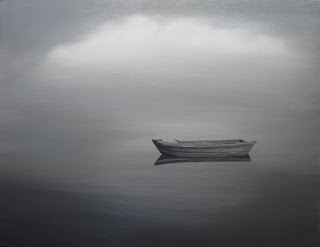 So I found an amazing photo on wet canvas (thanks so much happypaddler for sharing :)) that I liked. 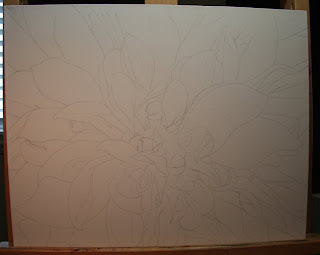 I changed the format a bit before transferring my sketch to the canvas. I am using a 16x20" gallery wrapped canvas with 2" sides so I will be painting around the sides as well. Well it was bound to happen, I seem to have gotten my acrylic paints everywhere, carpet, hands, hair, splattering other paintings inadvertantly...and now my computer screen. I tried to be more careful, it made me really miss my watercolors, but the area where there was no paint on my monitor kept getting smaller and smaller. So I took the plunge and decided to try to clean it. This is another piece I am playing around with. It is really hard to photograph as the surface is very shiny & several of the paint colors are irridescent and interpherence colors which reflect the light even more so you don't see the real colors. If the sun ever does come out I will take another photo outside in the shade which should help.